This project was completed by Nidhin Pattaniyil and Reshama Shaikh. 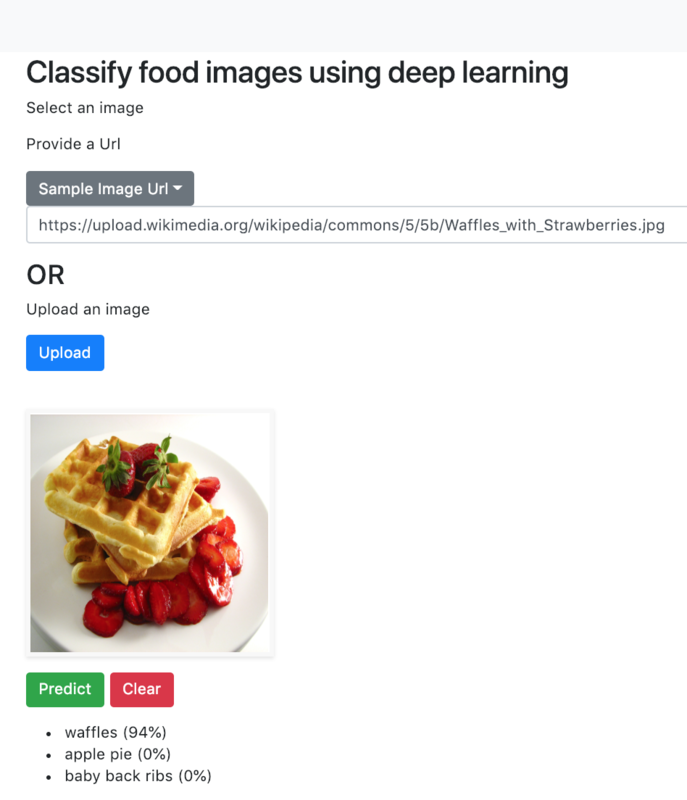 This article details how to create a web and mobile app image classifier and is deep-learning-language agnostic. Our example uses the fastai library, but a model weights file from any deep learning library can be used to create a web and mobile app using our methods. The fastai deep learning library, version 1.0 was utilized. Fastai runs on top of PyTorch. The fastai MOOC was officially released to the public in early 2019. The data was retrieved and analyzed on Google Cloud Platform(GCP). Any cloud platform (such as Paperspace or AWS) is usable, as long as a GPU is available. Instructions for setting up a GPU working environment will be available from fastai. For this project, we used the Nvidia Tesla P100 with 100 GB of storage. On purpose, the training images were not cleaned, and thus still contain some amount of noise. This comes mostly in the form of intense colors and sometimes wrong labels. All images were rescaled to have a maximum side length of 512 pixels. We used the Resnet-34 CNN architecture. The model took about an hour to run on GCP. The data is trained on a pre-trained model, resnet34, and we run the learner to determine the optimal learning rate. We did run more complex architectures. However, because the data had 101 classes and for the purpose of this example and article, and GPU time and storage, we used a simple architecture of resnet34. Next, we fit 8 epochs using our learning rate of 0.01, and we observe our error rate drops to 28.9%. Next, we unfreezed some of the last layers and looked for a new learning rate. We trained the data for 5 more epochs, which reduced our error rate from 28.9% to 28.1%. The confusion matrix revealed that the following foods were most commonly misclassified. The output of the deep learning model is a file with weights. The file is called model.pth (or final.pth). If you train the model as in this repo, the model is saved to the models folder. The final.pth file can be downloaded to your local computer from Jupyter. Store the model on google drive. Store the model on GitHub releases. Store the model on a bucket in the cloud. Heroku and Flask were utilized to deploy the web app. This output file from the classifier algorithm, model.pth is the input to the Heroku app. Replace our app name with your app name: APP_NAME="food-img-classifier". As an example: if you classified birds, your app name could be APP_NAME="bird-img-classifier"
If you don’t have a Heroku account, create one here: www.heroku.com. Each line can be copied and submitted on the terminal. Note: After 15 minutes of inactivity, Heroku will suspend the app. The next time the web app is called, Heroku will restart the app. There could be a slight delay in starting the app. Give it a try! Upload an image or add a URL. The documentation for deploying a mobile app can be found in this folder, docs.